Here you’ll find the most popular types of shower doors for your bathroom remodel project. 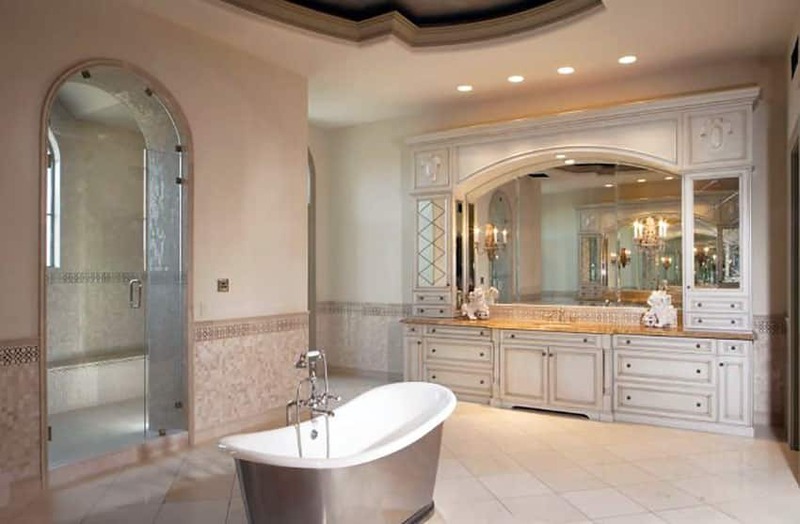 When considering a remodel for your home, investing in the bathroom is one of the best decisions you can make. A new shower can make a grand impression, and selecting the right shower doors is an important task. 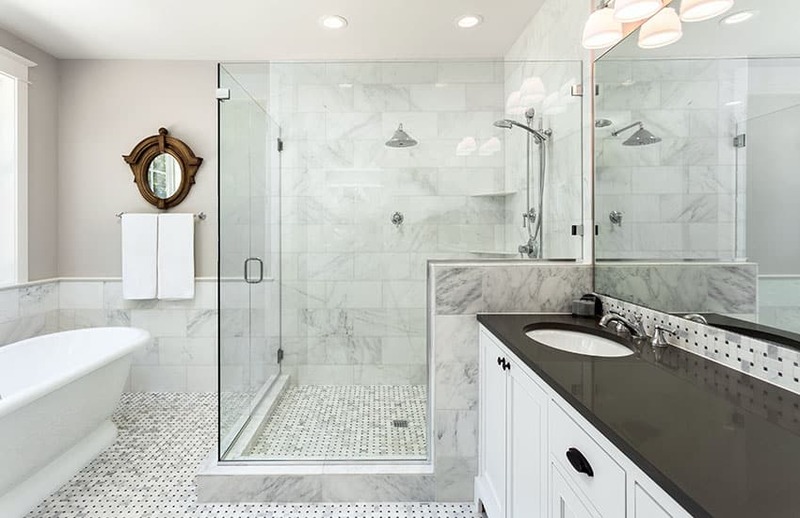 Below you’ll find different types of glass enclosures, and see popular shower door styles such as sliding, hinged, bi-fold, steam and pivot to choose the one that’s right for you. One benefit of an aesthetically appealing shower is its ability to transform the bathroom into a more pleasant environment. One large part of creating the atmosphere you want can be achieved depending on the type of shower door you choose. Certain shower door brands such as Kohler, Basco, Sterling and Fleurco have a wide range of types, shapes and sizes that can perfectly fit and beautify your space. See our ultimate guide to bathroom showers for more designs. There are generally three types of shower designs available. These are stand alone, corner stand alone and bathtub showers. The shower door you need will largely depend on the style of shower you have or are installing in your bathroom. To choose a door you will need to consider the opening size of the shower and the amount of space you need for an opening. From the various types of shower doors, the most prominent and popular types are as follows. 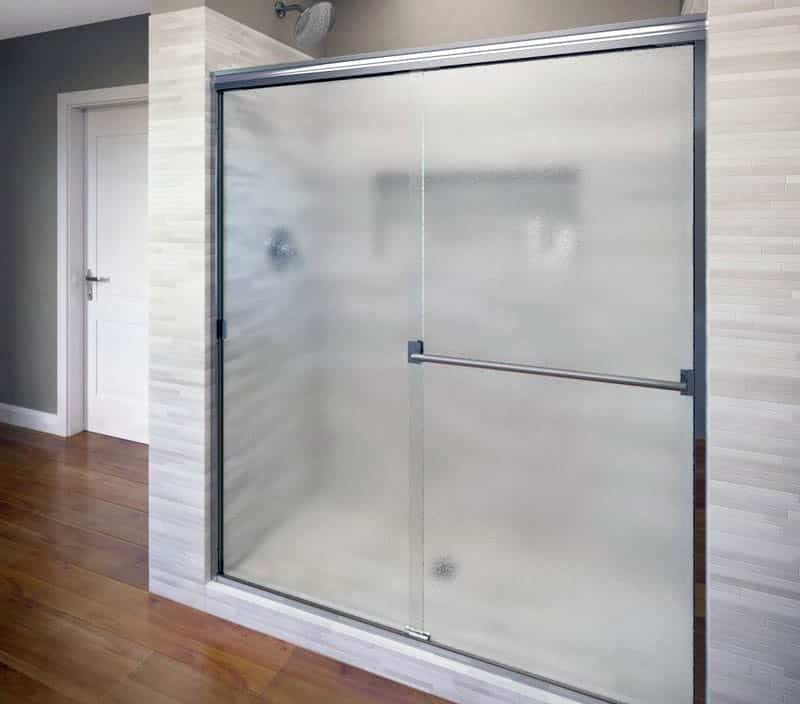 Sliding shower doors, also known as bypass shower doors are most popular for consuming a minimum amount of space, which also offers wide shower openings that take up at least 60 inches. These doors consists of two or more panels, sliding against each other attached to the sliding track from the top rail and the bottom rail. These can be used in freestanding showers or configured appropriately on bathtubs. Sliding doors are often used for bathtub showers, alcove and corner stand alone units. Pivot shower doors are operated through a pivot hinge that is attached either side of the door allowing a 180 degree and can turn outwards from one side. Additionally, the door can be revolved around the center if the hinge is attached on the center instead of the sides of the door. Other names for a pivot door are one panel swing or swing open doors. 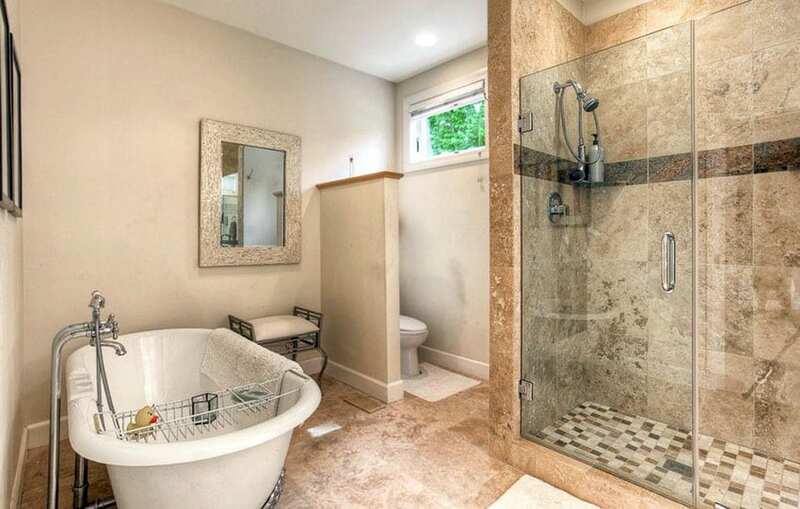 This master bathroom features a travertine shower with a pivot hinge door and freestanding tub. A hinged door resembles a typical swinging door that can be utilized as a shower door to open in one direction. The hinges can be screwed on the shower panels or the adjoining walls. Hinged shower doors are the most popular in freestanding shower cubicles or shower alcoves. Hinged shower doors are often referred to a side mount hinge doors due to the placement of the hinges at the top and bottom. One benefit of this style is it provides more support for the door which prevents the need for a header along the top of the door. This setup is ideal for frameless glass shower styles. Round shower doors are usually opened inwards and contain additional space because of the curvy edges of the door. Round shower doors are often installed as corner freestanding shower doors which gives ease in maintaining purposes due to the curved shape of the door. The door themselves are connected at the top and bottom of the frame which provides more strength for a smooth operation. This type of door can usually be reversed to utilize left or right access entry. Neo angle shower doors consists of three panels, one as the door and the other two as shower panels that are installed perpendicular to the walls. Neo angle shower doors are a best fit as a corner freestanding shower. This type of design can take up little space, or for larger bathrooms the design can go big and become a beautiful focal point. The doors generally can be installed to swing open from right or left. 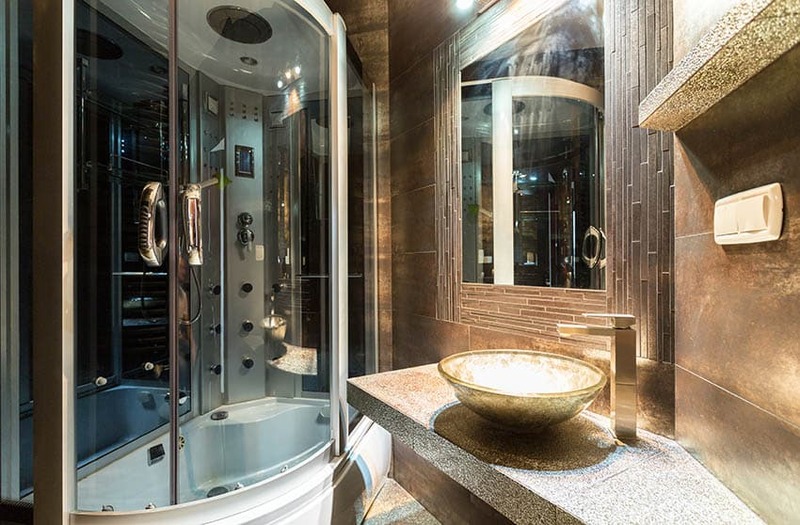 Visit our gallery of luxury showers to see out gallery for more ideas and inspiration. Bath screen shower doors are the best of both worlds using a mechanism of the sliding track of a bypass door and the folding technique of a pivot door. Two panels of bath screen doors are attached by a bi fold hinge and tightly folded inwards onto one another forming a pathway to walk through. There are also tri fold shower doors available, however they are much less common than a standard shower bi fold door. 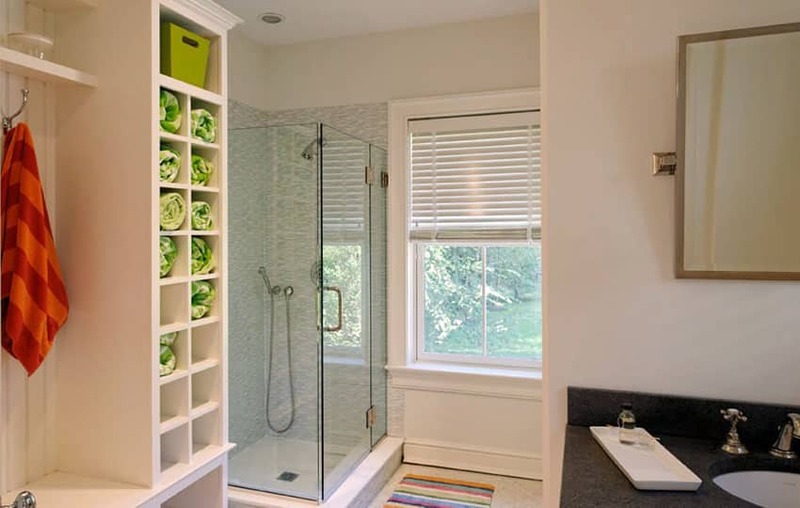 A bi fold door is a true space saver for a small bathroom design renovation. The folding doors are ideal for low space situations with small walk-in openings. The folding doors maximize space in a standing shower without interfering with traffic by swinging outward or inward. Want to feel the indulgence of a health spa from the comfort of your own home? Steam showers equipped with digital controls and a small steam generator can produce a luxurious sauna like experience that can leave you feeling relaxed and renewed. If you are installing a steam shower, you might want to consider the perks of installing a steam door in the shower cubicle. To get the facts straight, the steam door is steam proof from all the ends of the door from the floor to ceiling to contain the steam inside the shower cubicle. Usually, steam door can come in many design styles from glass bypass (sliding) doors to air tight pivot doors. 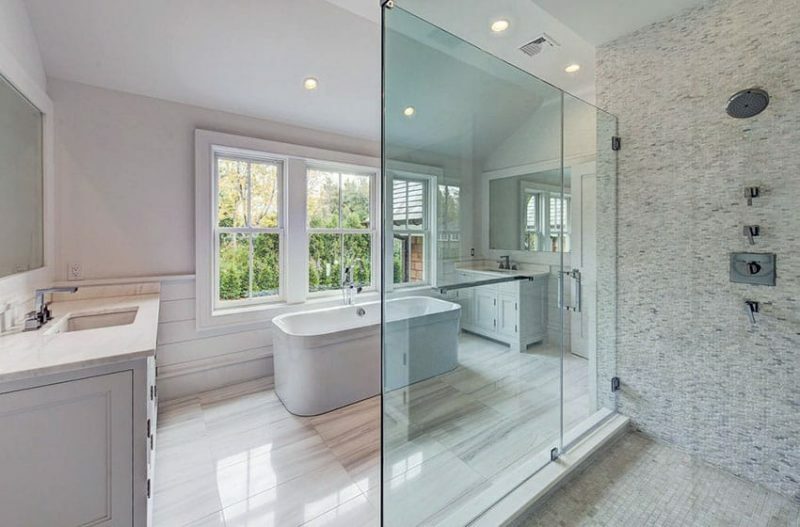 This custom shower steam door has curved glass at the top which opens to an expansive bathroom layout with free standing tub and cream color vanity with curved mirror. 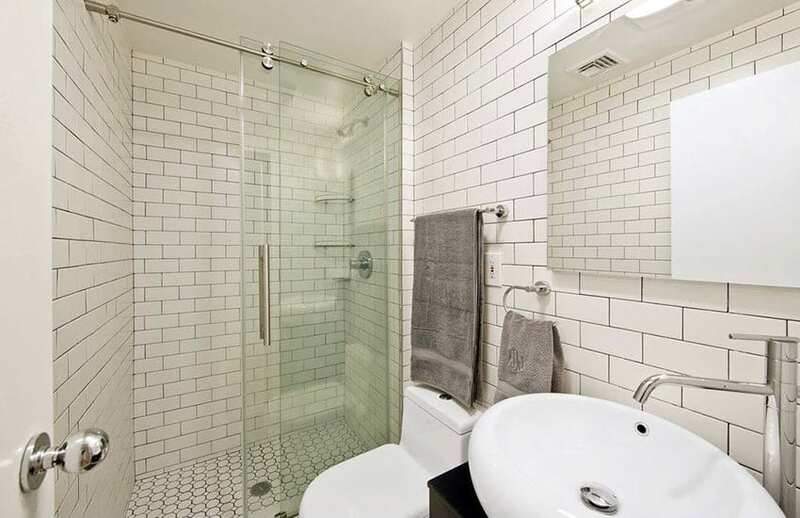 Framed shower doors are generally made out of aluminum or other composite materials with frames that runs horizontally and vertically on the door. Framed shower doors can be of a little hassle when it comes to the cleaning procedure as the frames of the shower door tend to collect water. A glass and an aluminum combination can accentuate the shower door and give it a unique flair of a traditional yet a modern washroom. A polished chrome gloss finish can serve pretty well too, for a framed shower door in combination with a type of a metal. Frameless shower doors are often installed in every modern household because of its contemporary appeal. these types of shower doors are highly sought after due to their design appeal and beauty. Added to the pros, the ease of maintenance and the simplicity it carries are why frameless shower doors are at the forefront. Frameless shower doors are pretty much flexible and it visually creates a feeling of spaciousness with the help of glass material that is often used for frameless shower doors. In today’s world designers have come up with interesting textures, patterns, colors with variations in material types for shower doors. Gone are the days, shower doors were instilled with only clear glass. Below are a list of variations of glass types. Clear glass is the most widely used type of shower door glass which lets maximum light penetrate and adds up to the brightness and the spaciousness of the whole shower cubicle. HD Glass is composed with less greenish tint which is why you get a crystal clear view of the inside of the shower cubicle. The HD Glass is capable of higher light transmission for a better definition. Frosted Glass has a distinct appearance and a texture that provides a blurry-like vision from one end providing visual control. One side of the glass consists of the frosted appearance whilst the other side is clear and smooth. What’s more interesting about rain glass is its ability to conceal marks or stains on the glass. The rain glass provides semi privacy as a result of the specifically designed rain like texture on either side of the glass. Bronze glass consists of characteristics of opaqueness for glass shower doors topped with a darker tint that provides full privacy to the users. Bronze glass shower doors are popular in the market for their trendy, aesthetically pleasing nature. Gray glass is a silver based darker tint that allows very little light to penetrate. These are a huge win in the market similar to bronze glass shower doors for their trendy appeal which makes them stand apart from traditional clear glass. 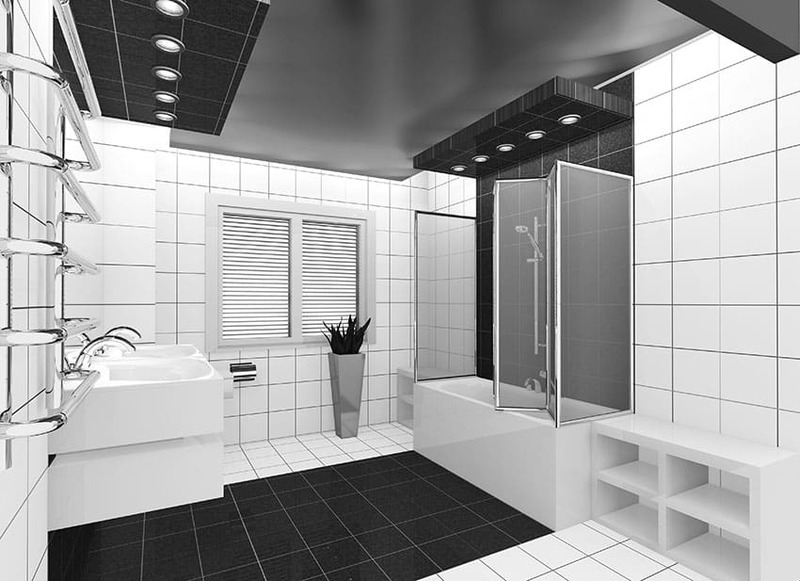 For more help creating your shower layout and design check out this page about bathroom remodel software. Using one of these programs its possible to quickly try out different shower materials to help you find the right one.